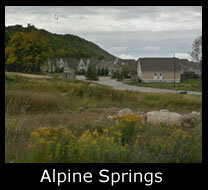 Alpine Springs, Blue Mountains – Craigleith is a small exclusive community of detached two level chalets nestled in the mountain by Alpine Springs Ski Club. These upscale chalets have generous decks and backyards, some overlooking the mountain, garages and some finished basements. Residents have exclusive use of a clubhouse and outdoor swimming pool with scenic views. Amenities: Clubhouse, outdoor swimming pool, exercise facility, views of Blue Mountain, walking distance to Alpine, landscaping, snow removal.